Early this Summer, I began a new job, as Artistic Director for the Morristown Theatre Guild. This is the 80th Season for the Guild, Tennessee's oldest community theatre, and I'm one of a very select few who have held the AD position. The work has been quite constant and demanding of both my time and my creative efforts, thus the writing and posting here has been sporadic rather than daily. It is not my wish to allow this page to dwindle away to occasional mutterings - though in truth, my ponderings on aspects of live theatre and staging and plans and collaborations do often make me a distracted muttering fellow. Currently, the Guild is presenting the second weekend of a comedy called "Rex;s Exes" in Morristown at Prater Hall in Rose Center, Nov. 21, 22 and 23. 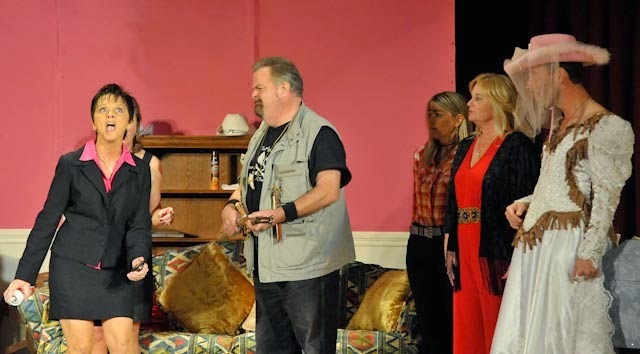 The sheer farce and fun of the show is the reason it captivates actors and audiences - meaning, everyone laughs and laughs hard at the show. And that is a primary and vital value to the show - laughter is a powerful and healing force in the world. "Rex's Exes" is the second in a series of comedies by Jones, Hope and Wooten, a trio who creates a massive collision of the slightly odd family named Verdeen with their own plans and desires - and still in this mix of mad comedy the writers gently poke fun a gender roles, marriage, life and death, politics, fame and the tedious challenge of getting older. But mainly, fun is the goal here. As the Guild makes plans for their 81st Season, I'm focusing our efforts on education programs, on celebrating the many people whose prodigious careers in theatre began on the Guild stage, and on the effort to renovate the Guild's playhouse on Hill Street, a building dating back to the late 1880s. Theatre isn't simply a jazz-handing, song-and-dance spectacle of flying Spidermen or French peasants in revolt, it isn't simply the verbal pyrotechnics of Shakespeare, or the bare bones of tragedy splayed out for all to wallow in and despair. It is a true collaboration of word and sight and sound whose final sum is far more than any of it's parts. A good show is the result of hard work by many the audience may not even see - costumers and designers and volunteers. And the collaboration is not complete until the actors and audience meet in the ancient rite of communal experience. So perhaps you'll tolerate my occasional absences here as I work on the tasks now before the Guild. And expect more posts about the work I'm undertaking, about the nature of art and theatre and more. I promise, it won't be dull.